Ready to move forward with building a custom home but still need to choose a builder? Look no further, Adair Homes has all you could ever need from a custom home builder. In order to have the best experience in building a custom home, you must ensure that you choose the best homebuilding partner for you. 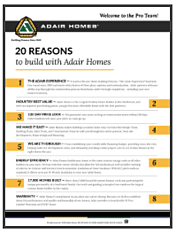 Use this fact sheet to learn why Adair Homes is the largest provider of custom home builds in the Pacific Northwest -- and why we might be the builder for you!